Are you looking to increase your visibility on Instagram? Have you considered reaching out to influencers? Partnering with influencers increases reach, brand awareness and revenue. 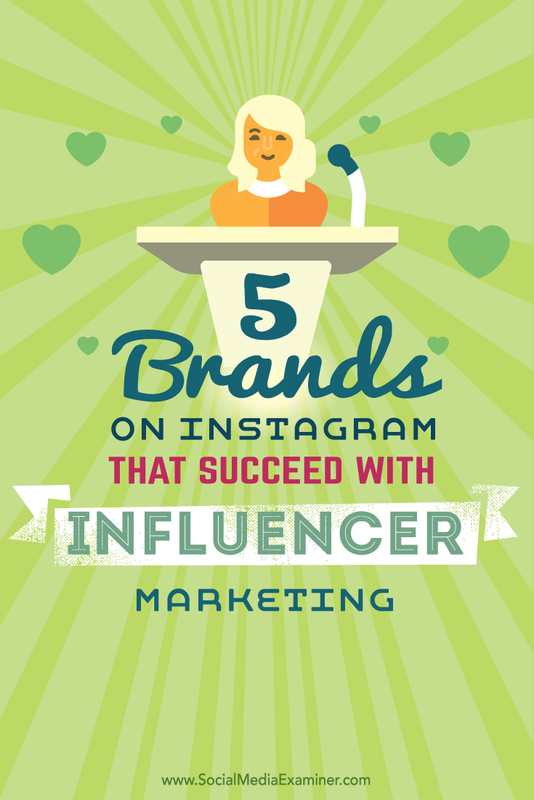 In this article you’ll discover five brands tapping into the power of Instagram influencers. With more than 300 million users, Instagram has become one of the most engaging visual platforms. Product promotion is key on the platform, and there is no better way to showcase your brand’s offerings than partnering with social media influencers. Discover five brands succeeding with Instagram influencer marketing. Influence is audience reach (number of followers) multiplied by brand affinity (expertise and credibility) and strength of relationship with followers. Social media influencers are modern-day celebrities. There are over 40,000 influencers on Instagram covering all verticals, including fashion, beauty, health and wellness, home décor, food and more. With tens of thousands to millions of followers, influencers are trusted for their opinions and they can add credibility to the products they promote. Here are five brands and their Instagram influencers worth checking out. Birchbox wants their beauty-obsessed Instagram followers to discover the best new lifestyle products and grooming tools. Therefore, Birchbox partners with in-demand beauty influencers who showcase new products, promote giveaways or just model their latest trends. Birchbox teamed up with lifestyle blogger Emily Schuman of Cupcakes and Cashmere to curate their May box. Birchbox and Emily (who has more than 260,000 Instagram followers) both promoted this partnership with five Instagram photos, which received over 18,000 likes and reached more than 550,000 consumers. 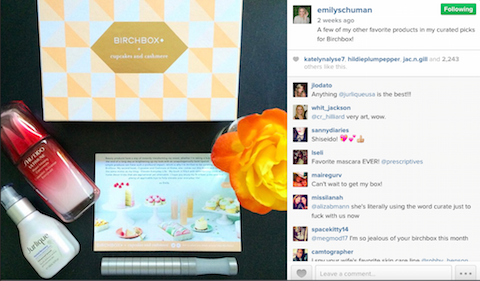 Birchbox teamed with Emily Schuman to curate and promote their May box. The dual effort resulted in a lot of likes and extensive reach. 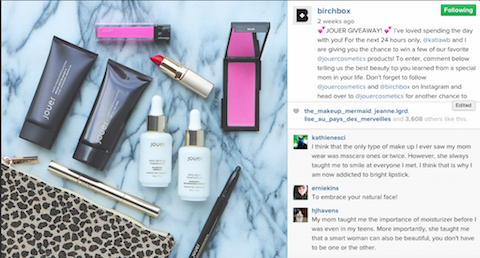 Birchbox also excels at Instagram takeovers (where guests take over posting on their Instagram account) and giveaways, and even combines the two. Instagram contests can include like to win, comment to win, tag a friend or a photo challenge. Christina Zilber, founder of Jouer Cosmetics, took over the Birchbox Instagram account for Mother’s Day, and posted four Instagram photos detailing her life in Los Angeles. The day culminated in an Instagram giveaway where users commented on the best beauty tips from moms. This resulted in 1,135 user-generated posts and tremendous engagement on Mother’s Day. On Mother’s Day, Christina Zilber did an Instagram takeover of the Birchbox account and then a giveaway. Find influencers in your specific niche to partner with and co-create a product campaign, takeover or Instagram contest. You’ll generate brand awareness and new fans and customers in no time. You don’t need a large budget to implement these tactics. There are influencers for everyone, as long as you have a product they want to try. Madewell teamed with five influencers, including Stephanie Sterjovski and Bethany Marie, to promote the anniversary of their signature tote in their #TOTEWELL campaign. Using only five influencers, they reached over one million targeted consumers with high-quality content from rising stars in fashion. Madewell worked with five influencers to promote the anniversary of their signature tote, and reached more than one million targeted customers. As part of their Instagram strategy, Madewell also regrams their influencers’ photos. For example, they posted Jules Denby’s Instagram photo onto their own account and featured her on their company blog. This is a great cross-promotion tactic and an extra incentive to get influencers to work with you. Just make sure to include the influencer’s handle and relevant hashtags on all posts. Also, add your website link to your Instagram bio to drive traffic created by your Instagram influencers to your blog. Boxed Water worked with influencers Jaime King, Megan DeAngelis and Aidan Alexander to spread the word about their philanthropic campaign with the National Forest Foundation: The Retree Project. For every Instagram photo posted with the hashtag #Retree, Boxed Water will plant two trees. A month after it has launched, there were more than 2,600 Instagram photos with #Retree. 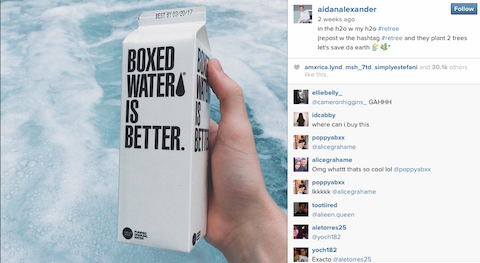 Boxed Water teamed with influencers to spread the word about the #Retree project, and got a great response. Working with Instagram influencers on social impact campaigns is beneficial in many ways. Influencers already have immense reach, so campaigns can easily go viral. These campaigns position both the company and the influencers in a positive light. Even better, influencers have fun creating engaging posts surrounding social impact campaigns, so it’s easy for them to get involved and insert their own personal branding into the cause. Many Instagram influencers are delighted to support causes. Do some research. Find influencers who support your cause and similar ones, and reach out to them. Many times they are happy to post about your mission (free of charge), and their followers are eager to respond to the call to action. The Johnnie Walker brand is all about having experiences and enjoying life. Their Instagram strategy reflects this as they partner with influencers who have a sense of adventure. Their influencers have traveled to Milan for Formula 1, Scotland to take photos of Johnnie Walker’s heritage and Shanghai to capture the launch of a new luxury product. But you don’t need to be a 200-year-old company with a big budget to create the same sense of enthusiasm. 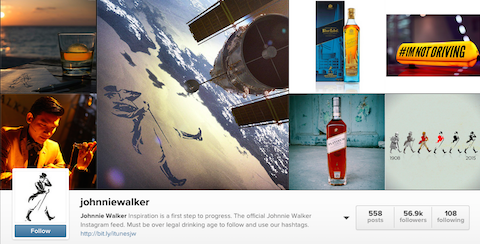 Johnnie Walker teams with influencers who have a sense of adventure that matches their brand. Ask influencers to take videos or create hyperlapses to pump up the energy on their (and your) Instagram feeds. Get creative. Invite influencers over to your headquarters to do an Instagram scavenger hunt or behind-the-scenes tour. When influencers create excitement over your products, it makes them more desirable to their audience, as well as yours. NatureBox knows 20% of women active on social media are motivated to purchase products from bloggers. After all, word-of-mouth marketing generates twice the sales of paid advertising. 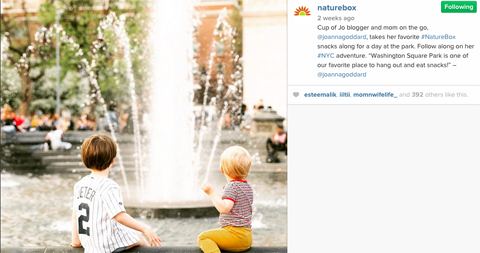 NatureBox worked with blogger Joanna Goddard at A Cup of Jo, who boasts over 50,000 Instagram followers. NatureBox posted three photos of Joanna’s children snacking on food from their monthly roundup. This resulted in 1,200 likes, and gave NatureBox credibility with some of the most-frequented mommy blogs on the Internet. NatureBox posted photos of influencer blogger Joanna Goddard’s kids enjoying their monthly featured snacks. Look for influencers who are not only popular, but also have a strong voice within your target market. If they frequently answer questions on their Instagram posts or even have an active and popular blog, see if they would like to do an AMA (Ask Me Anything) on their social media channels to highlight your company’s products. As consumers have become savvy to traditional marketing techniques, influencer marketing is a proven strategy to generate revenue while expanding reach. 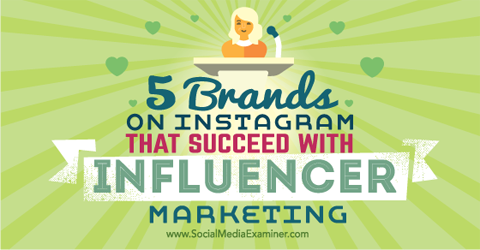 Find influencers in your space and capitalize on their status and popularity in your Instagram marketing. These five examples show there is a pool of resources and ideas to explore to promote your products, brand messaging and positioning using influencers. What do you think? How can you adapt what these five brands are doing for your needs? 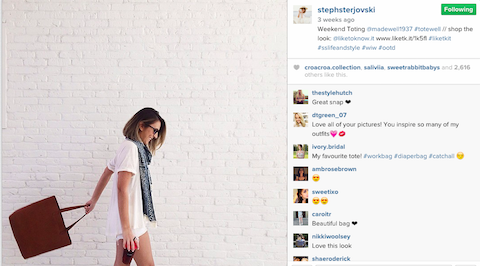 What other companies are rocking influencer marketing? Please share your thoughts in the comment section below. Tips for succeeding on Instagram with influencer marketing.